Interactive musical composition and performance have come to epitomise human interaction and social evolution generally. Lloyd Cole’s Identity vs Noise: 1Dn extends an interest in electronic music that he has pursued following his success with the band Lloyd Cole and the Commotions in the 1980s. The work builds on his earlier album 1D: Electronics 2012-2014, the superscript ‘n’ added to indicate an infinite number of possible sonic variations that can be generated within the new work. Cole discussed in depth the origins and mechanics of Identity vs Noise: 1Dn with a fascinated audience at the work’s launch at Nexus Arts in Adelaide. His specially designed equipment comprises a modular synthesiser that generates sequences of sounds to form pieces of music, heard through a pair of loudspeakers and transmitted to three other galleries—in Dublin, Tokyo and Helsinki—via a video screen showing a live feed from the Nexus gallery. The sonic raw material, or the ‘identity’ to which the work’s title refers, resembles the sound of an acoustic guitar or electronic keyboard. Adjacent to the synthesiser is a foot switch labelled “Press” that invites viewers to participate with is a corresponding switch in each of the other three galleries. Pressing it can cause subtle or significant changes to the sound—perhaps a shift of key, of timbre or even from consonance to dissonance. Such interventions constitute the ‘noise.’ If audience members in all four galleries happen to press their switches simultaneously, they will trigger a significant change in sound. If no-one in any of the galleries presses a switch, the sound will still evolve by itself as the synthesiser responds to the sounds it has itself generated—noise is inherent in the compositional design. But while we can influence the sound, we can’t control it and can’t predict what changes will be induced by pressing the switches. Cole’s synthesiser is capable of a greater range of sound shifts than, for example, a Mini-Moog, and the equipment overall is very attractively presented, establishing a persuasive audio-visual aesthetic in its art gallery setting. This work adds to the tradition of musical composition and performance using synthesisers and Cole pointedly states that he eschews the use of computers to make music. Lloyd Cole was commissioned to produce Identity vs Noise: 1Dn by the Hawke EU Centre for Mobilities, Migrations and Cultural Transformations, a department of the University of South Australia that focuses on the politics and culture of the European Union. The Hawke EU Centre’s website indicates that the Centre “examines migration, asylum and protection issues in an environment where war and conflict, climate events, and global economics are acting as ever-present catalysts for large-scale movements of people.” The intention in commissioning this work was to explore “the interplay of identity and difference.” The interactive, distributed nature of the work is thus a metaphor for human interaction across the globe, interaction that is uncoordinated and whose effects are unpredictable—sometimes harmonious, occasionally chaotic and always evolving. In his opening remarks, Cole indicated that once he has released a song it becomes, in effect, public property. This principle is extended in Identity vs Noise: 1Dn as viewers partly ‘take over’ the compositional process, and we might see this also as a metaphor for the process of public interaction, where a concept or principle expands and evolves as it circulates, its origins lost. 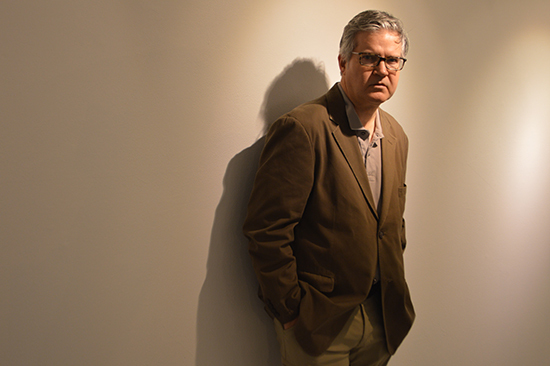 Lloyd Cole and the Hawke EU Centre provide important insights into music, electronic composition, performance and the nature of human interactivity. It’s to be hoped that viewers in all four galleries, rather than seeing this work as a musical novelty, will appreciate how, in experiencing it, their interaction with the world shapes the world itself. Lloyd Cole, Identity vs Noise: 1Dn, Installation hosted by the Hawke EU Centre for Mobilities, Migrations and Cultural Transformations at the University of South Australia.